PLEASE READ THESE TERMS AND CONDITIONS CAREFULLY BEFORE PROCEEDING TO USE THIS APPLICATION. These terms and conditions (Terms) create a legally binding agreement between you the user (you or your) and Borrow-it App Ltd, a company registered in England and Wales under company number 09575622with its registered office at 71-75 Shelton Street, Covent Garden, London WC2H 9JQ (we or us) in relation to your use of the Borrow-it mobile application and associated media (App). These Terms apply to the App including any updates to the App. We may change these Terms at any time. The new terms may be displayed on your device and you may be required to read and accept them in order to continue using the App. In any case, we will always inform you fully about any changes we make to these Terms. These Terms were last revised on 13 May 2015. (a) Registered users of the App must be of legal age in their home country and shall, in any case, not be younger than 18 years old on the date of registration. (b) You will be assumed to have obtained permission from the owners of the mobile telephone or handheld devices that are controlled, but not owned, by you (Devices) and to download a copy of the App onto the Devices. You and they may be charged by your and their service providers for internet access on the Devices. You accept responsibility in accordance with these Terms for the use of the App on or in relation to any Device, whether or not it is owned by you. (c) When registering, you agree to provide accurate and current information about you including your real name and contact information. If you choose to register to use the App by authenticating your identity using a third party service, then you must only do so using your personal account for those third party services. (a) We do not sell the App to you. We remain the owners of the App at all times. If any open-source software is included in the App, the terms of any open-source licence may override some of these terms in relation to such open-source software. (c) As we remain the owners of the App at all times, you must not make any alterations to, or modifications of, the whole or any part of the App or disassemble, decompile, reverse-engineer or create derivative works based on the whole or any part of the App or attempt to do any such thing except to the extent permitted by law. (a) The App enables you to advertise items that you are willing to lend to other users (in which case you will be the Lender). As Lender, you are entirely responsible for the way in which any items are advertised within the App including the existence, availability, appearance and functionality, fitness for purpose, legality, quality, safety or value of the items advertised. You are also responsible for ensuring that any items you are willing to lend are insured and that the terms of any insurance policy allow you to lend such items. 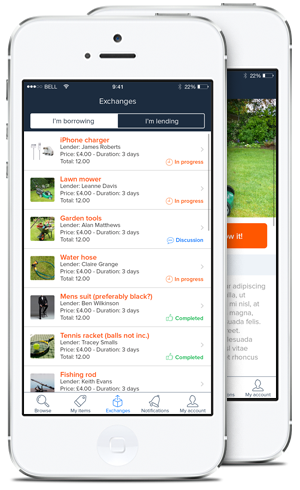 (b) The App enables you to borrow items from other users that are willing to lend them to you (in which case you will be the Borrower). As Borrower, you acknowledge that we do not in any way verify or guarantee the truth or accuracy of any description of the items advertised by a Lender within the App. (c) Subject to applicable law, a legally binding agreement may be made between Lender and Borrower on the terms that you agree in relation to payment (subject to the minimum charge referred to in section 6) and duration. We do not guarantee that any agreement between Lender and Borrower will be performed at all or in accordance with the terms agreed between Lender and Borrower. (d) You acknowledge that use of the App will be at your sole risk. You must evaluate and make your own judgment about your interactions with other users of the App whether through the App or in person. (a) You must not use the App in any unlawful manner, for any unlawful purpose, or in any manner inconsistent with these Terms, or act fraudulently or maliciously or otherwise use the App in a way that could damage, disable, overburden, impair or compromise our systems or security or interfere with other users. (d) You agree to indemnify and hold us harmless from any claim or demand, including reasonable legal fees, made by any third party due to or arising out of your breach of this section 5, your improper use of the App or your breach of any law or the rights of any third party. (a) The App enables Lenders and Borrowers to rate and review each other based on their experience, to assist other users in evaluating whether to lend items to or borrow items from other users. (b) You acknowledge that we do not exercise any editorial control over ratings or reviews posted by other users. If you consider any review to be defamatory or offensive in any way then you may report this to us and we may take such action as we reasonably feel is necessary including but not limited to the actions described in section 5(c). (a) We do not charge you for registering to the use the App or to browse items or advertise items within the App. (b) We charge the Borrower a fixed transaction processing fee of GBP £1 (including Value Added Tax) (Processing Fee) which will automatically be added to the amount payable by the Borrower to the Lender. (c) All payments made through the App are processed under the terms of an agreement between us and PayPal (Payment Merchant). The Payment Merchant’s terms and conditions will apply to any payment by you via the App and will be subject to the Payment Merchant’s handling fees which will be charged additionally. You can access the Payment Merchant’s legal agreements on its website. If there is any inconsistency between these Terms and the Payment Merchant’s terms and conditions, then these Terms will prevail in relation to any obligation that we have towards you. (a) You acknowledge that the App has not been developed to meet your individual requirements, and that it is therefore your responsibility to ensure that the facilities and functions of the App meet your requirements. (b) If you use the App for business purposes (and you are not a “consumer” as defined by the UK Consumer Rights Act 2015), you agree that we have no liability to you under any circumstances for any losses, costs, damages or expenses that you may incur through your use of the App whether direct, indirect or consequential (including but not limited to any loss of profit, loss of business, business interruption or business opportunity). (c) We do not accept any liability or responsibility whatsoever for any adverse or unfavourable ratings or reviews posted by other users via the App. (d) Nothing in these Terms limits or excludes our liability for death or personal injury caused by our negligence or for any other liability which cannot be limited or excluded by law. (e) Our maximum aggregate liability under or in connection with these Terms (including your use of the App) whether in contract, tort (including negligence) or otherwise, shall in all circumstances be limited to the sum of GBP £10. (a) We may transfer our rights and obligations under these Terms to another organisation, but this will not affect your rights or our obligations under these Terms. (b) Each of the provisions contained in these Terms operates separately. If any court or competent authority decides that any provision is unlawful or unenforceable, the remaining provisions will remain in full force and effect. (c) These Terms are governed by English law. If you use the App for business purposes (and you are not a “consumer” as defined by the UK Consumer Rights Act 2015), you and we both agree that the courts of England and Wales will have exclusive jurisdiction. If you use the App for domestic and private purposes (and you are a “consumer” as defined by the UK Consumer Rights Act 2015), you and we both agree that the courts of England and Wales will have non-exclusive jurisdiction.